When learning to work with bees, one of the most important tools you can have is the beekeeping suit also known as a bee suit. Being a successful beekeeper means knowing how bees react under different circumstances and what to do in order to protect yourself should they become agitated. You can’t do that while running away. Even the most experienced of beekeepers have been stung more than once, but thousands more stings have been prevented by wearing the proper gear. It is even more important to the beginner to avoid possible allergic reactions that were not known beforehand. Before attempting to work as a beekeeper so that you can be prepared if a reaction occurs, it might even be better to get stung. Some learners get themselves tested for bee related allergies to be sure that they will be safe if they are stung. Many bee handlers enjoy a sort of immunity to bee stings since their body develops a resistance to bee venom after being stung numerous times. Just don’t take chances if you are unsure and always wear full, protective clothing when working with bees and be prepared to take necessary steps if a reaction occurs. The professional beekeeper suit itself may include all of a veil, hat, body suit and gloves, but many of the more advanced beekeepers wear only the hat with veil to protect the face. These experts feel that a cumbersome full suit hinders them and the gloves tend to get in the way of detail work with the bees. And getting stung on the hand is easy to handle by simply picking the stinger out quickly to reduce venom flow into the body. These areas are attacked most if the bees turn aggressive and it is harder to remove stingers from areas that can not easily be seen. By remaining calm, most bee handlers avoid getting stung whatsoever. For most beekeepers, the suit, which usually consists of a jumpsuit, is made of light colored material and lets cool air in during the warmer months of use. The light color deters bees since it is not the darker shades of their natural predator’s appearance (i.e. bears, etc.). Plus, the beekeeping suit is made of special materials that prevent bee’s stingers from injecting and penetrating venom into the skin. Something to keep in mind when using the beekeeping suit is the removal of any stingers from the suit before taking it off since they can still sting you, and it is also important since they continually exude a pheromone that signals to other bees that danger is present. This danger can prompt further stings so regular washing of the suit will prevent unnecessary attacks. Washing soda is great stuff for washing the suit. It is also important to make sure the elastic that is in the ankles and cuffs is snug against the skin. If an opening is available, bees will find it and naturally crawl into the suit. Regularly check your suit for holes and proper fit to guard against unnecessary stings. One last item to the beekeeper’s wardrobe should be a pair of white rubber boots. With rubber being impenetrable to a bee’s sting it will protect sensitive areas of the feet. And they are very easy to keep clean. Your beekeeping club may be able to get beekeeping suits wholesale, so it is worth asking them to try if they are not already doing so. Beekeeping suits also come in youth bee suits. Even though you may be an adult the youth sizes may fit better. Also worth checking this out. 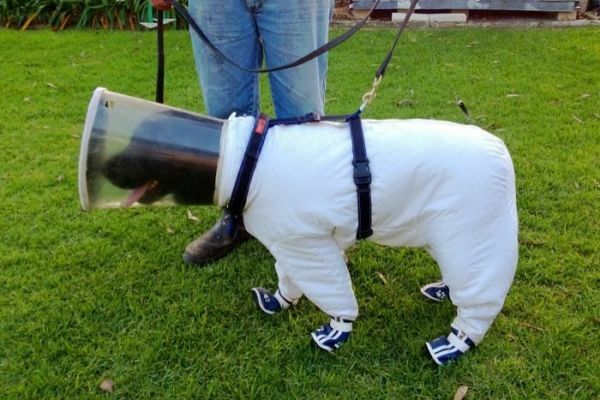 What do the experts think of the Beekeeping Suit? Don’t be discouraged by the story at the above link. Just read it and laugh. It won’t happen if you have even a half descent suit. Many experts feel that a cumbersome full suit hinders them and the gloves tend to get in the way of detail work with the bees. But since, the beekeeping suit is made of special materials that prevent bee’s stingers from injecting and penetrating venom into the skin, it is advised that beginners use them. Whether the experienced beekeepers wear their beekeeping suit or not may depend on several other things, e.g. the type of bee the have to deal with (some are more aggressive than others), the climate (they may feel it is too warm for it), personal preference etc. so a beginner need not feel self conscious about wearing it. Remember that even if they do not wear them all of the time, experts do keep them with their beekeeping equipment just in case. Don’t laugh, but they make them for dogs too.